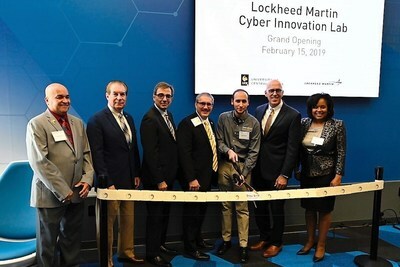 ORLANDO, Fla., Feb. 15, 2019 /PRNewswire/ -- Lockheed Martin (NYSE: LMT) and the University of Central Florida (UCF) celebrated the grand opening of a new Cyber Innovation Lab on UCF's campus that will help meet the growing local and national need for cybersecurity talent. The lab's opening was celebrated with a ribbon cutting, a demonstration by UCF's Collegiate Cyber Defense Club (Hack@UCF) and a panel discussion with U.S. military and Lockheed Martin cyber experts about technology trends and how students can prepare for a career in the growing field. "This lab will serve as the campus' primary hub for students to develop and expand their information security skills, preparing them to enter this high demand field and take on the cyber security threats of the future," said UCF President Dale Whittaker. "We are grateful for Lockheed Martin's longtime partnership and strong commitment to our students' success." The National Institute of Standards and Technology estimates there are more than 13,000 unfilled cybersecurity jobs in Florida alone. That trend will continue, as the U.S. Bureau of Labor Statistics predicts jobs for information security analysts will grow 28 percent by 2026. "The future battlespace will be heavily reliant on cyber… even more so than we're seeing today," said Stephanie C. Hill, deputy executive vice president of Lockheed Martin Rotary and Mission Systems. "By working with institutions like UCF, through labs like this one, we'll all better understand and accelerate our shared capabilities and potential to adapt and innovate in the fifth domain." In 2018, Lockheed Martin donated $1.5 million to UCF to help create the Cyber Innovation Lab and encourage the next-generation of science, technology, engineering and math (STEM) talent to collaborate and solve today's challenging cyber problems. The company's donation will fund software and technology support to the lab, and employees will also provide cyber training and professional mentoring to engineering students. "Having a centralized space will streamline the way we organize our meetings and practices," said Hack@UCF President David Maria, a senior studying computer engineering. "With this lab, we can practice for competitions, host workshops and speakers, provide cyber security tools and resources, and give our student members a sense of community and help get them ready for future careers. It's not just a practice space. It's a home for us." The 970-square-foot lab is located in UCF's Engineering I building and will serve as a learning hub for the more than 350 students participating in cyber programs at UCF. Hack@UCF, a four-time national champion in competitions like the Collegiate Cyber Defense Competition and the U.S. Department of Energy CyberForce Competition, will also use the lab as its primary practice center. In Orlando, Lockheed Martin employs approximately 2,500 UCF graduates, with plans to expand its cyber workforce. The company's local Cyber Solutions business grew 400 percent over the past five years and expects that growth to continue as the nation seeks offensive and defensive cyber security capabilities to address the evolving cyber threats. To learn more about cyber at Lockheed Martin, visit www.lockheedmartin.com/cyber. Founded in 1963 with a commitment to expanding opportunity and demanding excellence, the University of Central Florida develops the talent needed to advance the prosperity and welfare of our society. With more than 68,000 students, UCF is one of the nation's largest universities, offering more than 200 degree programs at its main campus in Orlando, medical school, and more than a dozen other locations in Central Florida and online. UCF was ranked by U.S. News & World Report among the nation's top 10 most innovative universities and rated by Kiplinger and Forbes as one of the best college values in America. For more information, visit ucf.edu.